When dental decay becomes advanced, it often destroys tooth structure down to the bone level. When decay reaches this point, it becomes impossible to restore a tooth unless we can expose more of the healthy root. For this reason, we perform crown lengthening surgery. The tooth is held within bone and just above the crest of that bone, our gums grow directly into the tooth. This area where the gums grow into the tooth is just a narrow band of tissue, 2 millimeters or so in width (indicated by the pink line in figure to left). This is called the gingival attachment and it serves as a seal between the sterile bone and the bacterial laden mouth. If decay has progressed down the root to this attachment point, restorative materials must be placed into an area that once was part of the gingival attachment. Fillings and crowns with their margin here will not be cleansable and the foreign nature of the restoration can cause chronic soreness and inflammation as the body has an immune reaction to the foreign material. 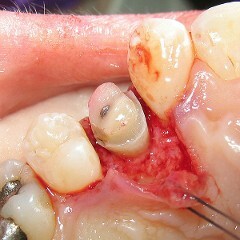 As such, crown lengthening is essential when a compromised tooth with decay into the attachment is going to be restored. While it adds to the cost of restoring a tooth, skipping this procedure will greatly reduce the longevity of the restoration and can give rise to a myriad of other problems. Crown lengthening surgery involves making an incision about the teeth. Then the gum tissue is carefully reflected back to fully expose the bone about the tooth. Bone is then removed from around the tooth--1 to 3 millimeters--depending on the individual case. Once the bone is smooth and shaped well, the gum tissue is returned to its position and sutured in such a fashion so that when it grows back into the tooth (just above the bone) it grows in lower on the root surface, below where the decay was. Once the gums have healed fully, the dentist may then remove all the decay and safely restore the tooth. The restorative material (crown or filling) may now be kept well away from the gum attachment. Dental care professionals speak of a "biological width." This is the distance that a restoration must stay away from the gum attachment. It is about 1.5 to 2.0 millimeters. Allowing a restorative material any closer to the attachment can produce significant inflammation in the tissue. When the restorative material is directly into the attachment, severe inflammation occurs as the attachment is breached and it must be avoided. 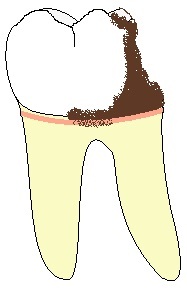 The diagram to the right show how decay (brown) has encroached on the gingival attachment (pink). Dr. Titus refers patients requiring crown lengthening to a dental specialist--normally a Periodontist. This dentist has post-doctoral training in treating gum disease through surgical means and as such, they are highly adept at bone removal, recontouring bone, suturing gum tissue, working with the bone about the teeth and managing patients who have undergone gum surgery. As such, they prove to have excellent results performing crown lengthening procedures. After crown lengthening surgery is complete, a patient must wait 40 to 50 days for healing to occur before a final impression for a crown can be taken. 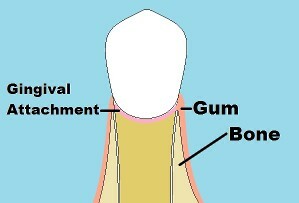 During impression taking, a small piece of string is packed down under the gum tissue. This pushes the gum tissue away from the shaped tooth and provides a clear, clean and accurate impression. It is essential that full healing has occurred so that this string packing process does not destroy the fragile, healing attachment about the tooth. Not all compromised teeth can be saved with crown lengthening. In fact, it is not suitable for many teeth. The shape of the root, the extent of the decay, the pattern of decay and a host of other issues can make a tooth unsuitable for this procedure. Often, a compromised tooth will require a crown, root canal therapy and crown lengthening. The crown lengthening procedure is the most tenuous. It is suggested that patients with such a compromised tooth check FIRST with the Periodontist to make sure they can perform a successful crown lengthening procedure before engaging in costly root canal therapy or crown procedures. This would involve just a consultation visit with the Periodontist so they may examine the patient and take a radiograph of the tooth. While it adds and extra visit to the restorative process, it is the only way to insure that a root canal or crown is not done unnecessarily--as the tooth is non-restorable from a crown lengthening aspect and then must be extracted.